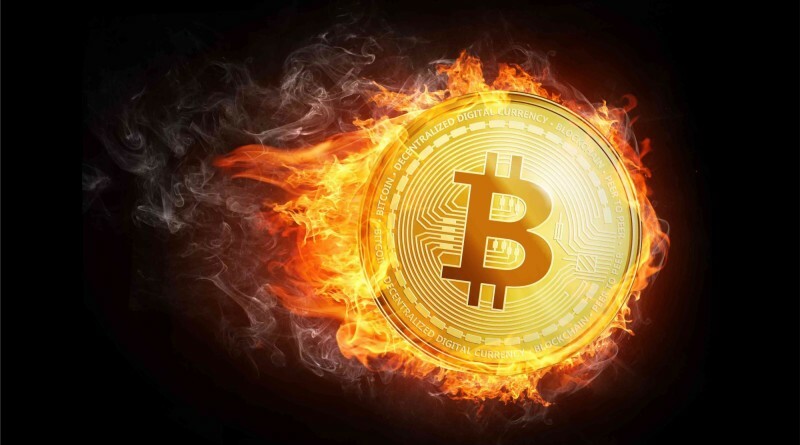 BITCOIN WILL BURN THE PLANET DOWN. HOW FAST? MAX KRAUSE WAS thinking of buying some bitcoin, as one does. But Krause is an engineer—mostly he works on modeling greenhouse gas emissions from landfills—so his first step was to run the numbers. He looked at price, of course, but also how fast the world’s bitcoin miners create new bitcoins and the ledger that accounts for them. And he looked at how much electricity that would seem to require. Krause’s calculations aren’t just back-of-the-envelope noodling, cryptocurrency blog trolling, or white-paper crossfire. His calculations of how much energy—and planet-warming carbon emissions—the top four cryptocurrencies might be responsible for appears in an article in the journal Nature Sustainability today, joining a growing canon of peer-reviewed and rigorous work trying to put numbers to a problem the cryptocurrency world has been grappling with for years: How much energy blockchain-powered currencies consume, and how much does the answer matter? Whoever Satoshi Nakamoto is, the genius of his, her, or their idea for bitcoin—published almost exactly a decade ago—was in solving the key problem with digital currency: You can generate more by just copy-pasting. Nakamoto’s idea was to indelibly timestamp every transaction on a continuing chain. Do some really hard math—specifically, find a number that you can “hash” with an algorithm called SHA-256 to produce an answer everyone on the network agrees is right—and you not only create a new block in the chain, but you also get a reward: bitcoins. That system is called “proof of work,” as in, you have to prove you did the math to get the money. In their new paper, Krause and his co-author follow, at least for its first half, what has become in the past few years a fairly standard method. 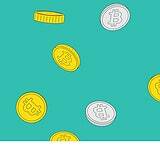 It starts by interrogating the blockchain network or aggregation websites for how many of those calculations happen in a given amount of time—every day, or every second. That’s the hash rate. (Krause says in August 2018 that was 50 quintillion hashes per second on Bitcoin alone.) Then you find out how much energy the top-of-the-line mining computers use, often in joules per hash. That measurement is trickier, for reasons I’ll get to in a moment. Multiply those together and you know how much power the network is using. With that number in hand, you can figure out how much electricity a cryptocurrency consumes. It’s 3.6 million joules to 1 kilowatt-hour. Past estimates for Bitcoin have ranged from 4 or 5 terawatt-hours per year up to 44 TWh/yr, as much Hong Kong used in 2017. Krause says it’s more like 8.3 TWh/yr, roughly the energy use of Angola. But Krause went further, adding estimates for power use by the three next-most-popular cryptocurrency networks—Ethereum, Litecoin, and Monero. Tally that up and ballpark the dozens of smaller entries and you basically double the number, 16.6 TWh/yr, putting cryptocurrency electricity use on a par with Slovenia (with an eye on surpassing Cuba). The carbon footprint of a cryptocurrency varies depending on how much energy the network uses and the kind of energy used where the coin is mined. The real question, though, is whether that power use matters. Krause’s paper tries to make the link between metaphorical bitcoin mining and actual, mining mining by comparing the energy it takes to get the equivalent of $1 worth of cryptocurrency and $1 worth of various valuable metals—gold, platinum, some rare-earths, and so on. The answer: It takes more energy to get a buck’s worth of bits. It was 17 megajoules for a dollar’s worth of bitcoin but just 4 MJ for a dollar’s worth of copper. 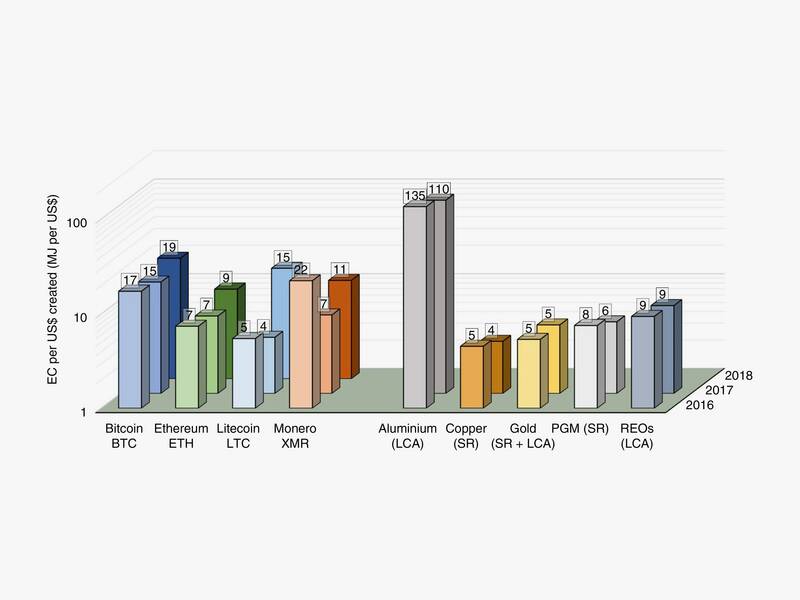 In general, it takes more energy to mine $1 worth of cryptocurrency than to mine $1 of precious and commodity metals. Aluminum is an exception; it’s extremely energy-hungry. Implied in all these questions about energy use are concerns over greenhouse gas emissions. Cryptocurrency advocates and opponents alike want to know whether their decentralized, secure, government-free monies are also destroying the planet. And that depends on where the power comes from. Obviously a renewable source like geothermal or hydro wouldn’t emit carbon, though it might siphon off power that other people needed for less crypto-like uses, like lights and air conditioners, which might mean increased power generation overall. 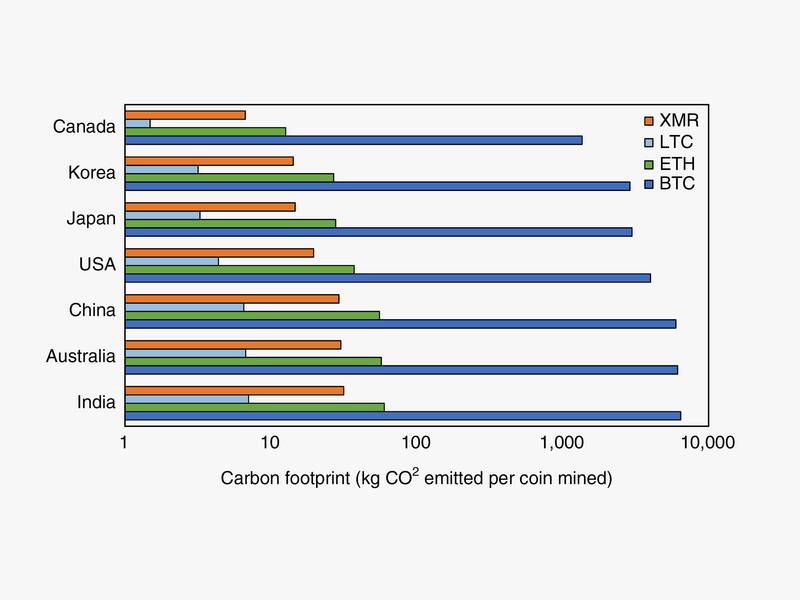 Krause’s numbers show that bitcoin produces a lot more CO2 than the other currencies, but also that a bitcoin mined in China emits four times the CO2 than a Canadian-grown bitcoin. That’s the real worry. Last year, an article in Grist calculated that the bitcoin network would be using more power than the US by next summer, and more power than the entire planet generates by 2020. Even if that’s not plausible, an article by a team of researchers from Hawaii in the journal Nature Climate Change last week did much the same kind of calculations as de Vries and Krause and found that bitcoin usage resulted in the equivalent of 69 million metric tonnes of CO2 in 2017. If bitcoin grows like other technologies, the authors said, it’d cough out enough greenhouse gas to warm the planet by 2 degrees celsius by the mid-2030s. It’s not even clear there’s any way to stop it. Even when cryptocurrency values started crashing this year, network hash rates kept increasing. On the one hand, that kind of uncoupling between price and hash rate seems like a fundamental problem in a currency, but Bonneau says it’s probably more that hash rate is a trailing indicator. “Miners have a lot of fixed costs. They have to buy land and equipment. They have some marginal costs in electricity, so they’re generally operating at a pretty high margin,” Bonneau says. “Even if the price goes down a substantial amount, it’s still profitable for them to keep their hardware turned on.” Big industrial miners might even buy their electricity on a fixed contract, which gives them even less reason to be responsive to price.